Put the meat in the freezer for half an hour before you start making the sausages. A nice, juicy and cold meat is the key to making the most succulent sausages with a meat grinder. Clean the meat grinder thoroughly and sharpen the blades otherwise dull blade will smear the meat and all the juices will go to waste. Put all the ingredients to one side so you can grind the meat before getting it warm. Mix all the ingredients gently with your hands. If you want to make sausage links, a casing is essential. Buy a hand-made collagen casing or explore other available options. Selecting the ingredients is very important to make sausages full of texture. The main rudiments are juicy meat, fat and the perfect blend of garlic, salt, onion and black pepper. Use some sort of liquid as a binding agent. This could be any fruit juice, cream, wine or just the water. Select the best meat for your sausage like deer, pork, beef or lamb containing 20-30% fat. Once all these essentials are gathered, you are ready to make sausages using your meat grinder. Put the meat and even the meat grinder parts (if you have space) in your freezer to chill down and guarantee you the perfect texture for your sausages. Don’t allow the meat to get too frozen otherwise your best meat grinder’s motor will be in trouble. By freezing the meat a bit, you will preserve the fat and meat juices without smearing taking place. During the grinding process, place the unground meat in a bowl filled with ice to avoid warming it. Make sausages using your meat grinder by grinding the meat and fat well so that the fat absorb totally in the mixture. Make sure to remove any connective tissue or gristle from your cuts before starting. Gather all your spices including the liquid and mix them up so that all your spices like black pepper, grated onion, garlic and salt absorb deeply throughout the meat and fat. Don’t integrate the ingredients with a lot of pulverizing. Immerse the casings in hot water for 20 to 30 minutes. When you are going to use the casings, wash them with cold water. Glide the end of the casing against the tube of the sausage stuffer and fasten it with a knot at the opposite end. When the casing is filled, place it on a clean surface. Select the length of link you want and then squeeze the sausage by twisting the link. Continue with this until the stuffed casing is finished. After getting the sausages length fixed and twisted, hang the sausage links on a rack to let them dry. You can also measure the weight of sausages if you want equal sized links. One you have completed sausage making with your best meat grinder, you can now enjoy fresh and healthy sausages any times. If you have made sausage in patty shapes to prepare on the grill, there will give off a great flavor. 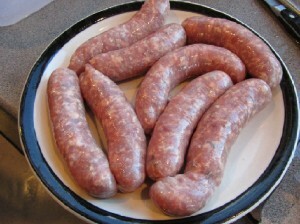 Here is a simple recipe to make sausages using a meat grinder for breakfast. By following this simple procedure, you are going to enjoy the healthy meals with added flavor all the time.